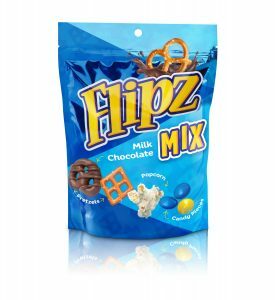 NEW YORK — Flipz announced the launch of Flipz Mix, a deliciously fun assortment of your favorite sweet, salty, and crunchy snacks combining Flipz milk chocolate-covered pretzels with popcorn, pretzels, and candy-coated chocolate pieces. The Flipz Mix features the brand’s signature chocolate-covered pretzels while adding a spin with new ingredients. Flipz snacks always provide the perfect combination of sweet, salty and crunchy, guaranteeing consumers a tasty, satisfying experience without having to sacrifice your taste buds. Perfect as a shareable treat with friends or the whole family, Flipz Milk Chocolate Mix is now available at CVS retailers nationwide in the snack and candy aisles in 4 oz. ($2.49) and 6.5 oz. ($3.49) bags. Flipz Mix will also be available additional retailers nationwide later this year. And coming soon, there will be another flavor added to the snack mix line: Flipz Mix White Fudge featuring Flipz white fudge covered pretzels, popcorn, pretzels, and sweetened dried cranberries.